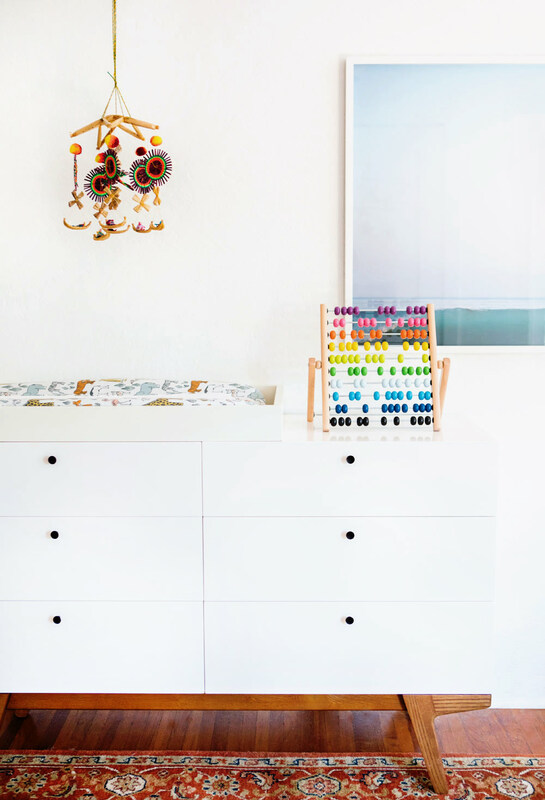 When I started designing the room it was important to me that it be a space that he could grow into, something not too precious, that had whimsical moments mixed in with grown-up design details that Lou and I could love as well. I’m so happy that I got to a place with the room that feels just right for us! 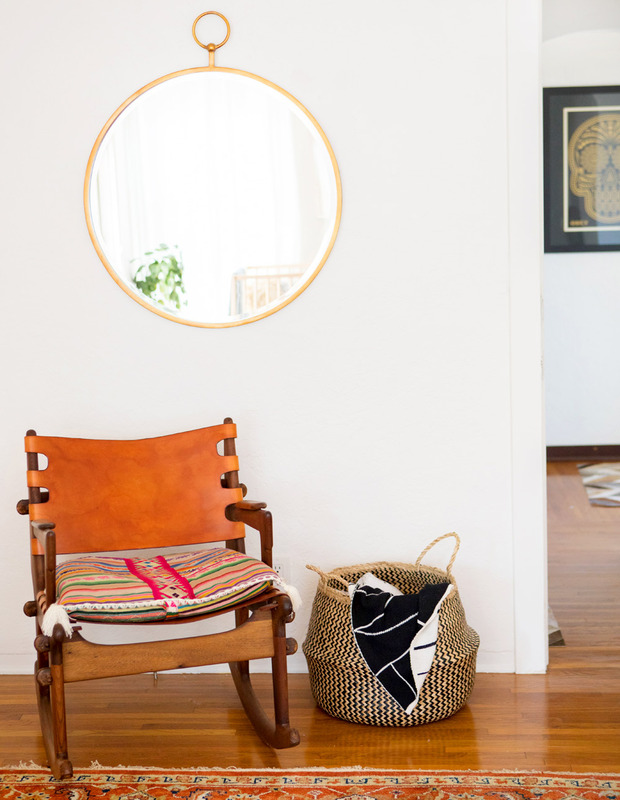 Let me get right to the details: THAT RUG! It’s quickly become my favorite in the house and is perfect for a baby’s room. Mateo has thrown up on it (ugh) more times than I can count and it looks no worse for the wear. It will get better with age, isn’t so specific that I can’t make it work with many different style rooms that he may have down the road (or happily move it into another room if need be!) It was actually the very first piece I picked out for the room, and everything else I chose around it. Although I knew for a long time that I wanted this Ikea crib. SEVENTY NINE DOLLARS. Raw wood. Simple design. Need I say more? I am SO happy with it! 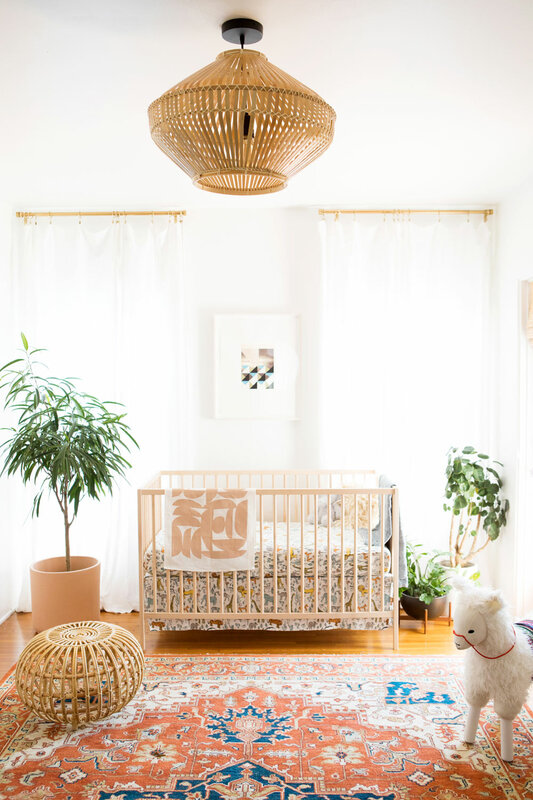 Originally I wanted two of those extra large and beauteous terra cotta planters from Norden to sit on either side of his crib and create some wonderful symmetry (I realize I am a complete and utter nerd for wanting “wonderful symmetry”, but neither here nor there). Unfortunately a giant planter on the right side made it nearly impossible to get in and out of the door so I opted for two smaller planters. I’ll have to get my wonderful symmetry kicks somewhere else I guess. Shall we talk about the llama in the room? HA! In all seriousness I love it and Teo loves it and it felt like the perfect toy that could add that whimsy I was looking for. That ottoman opposite of it gets way more use than I even knew it would- sometimes it’s a seat for me while Teo is playing, sometimes I use it to block the plant behind it, and Teo loves pulling himself up on it and slapping his hands on it like a giant silent bongo drum. It’s perfect in my book. I’m in love with the animals on his “safari” bedding (fitted sheet and skirt). I can’t wait until he’s old enough to start learning about them, and when he points at them and makes the respective animal noises I might die of happiness. A small price to pay for the design choice I suppose. Also shown: handmade pillow, tea towel, cozy linen baby blanket, art by Kevin Appel, curtain rods, clip rings, curtains. This dresser lived in our bedroom for a long time, but it makes the perfect dresser for Teo so we consolidated our clothing and moved it into his room. 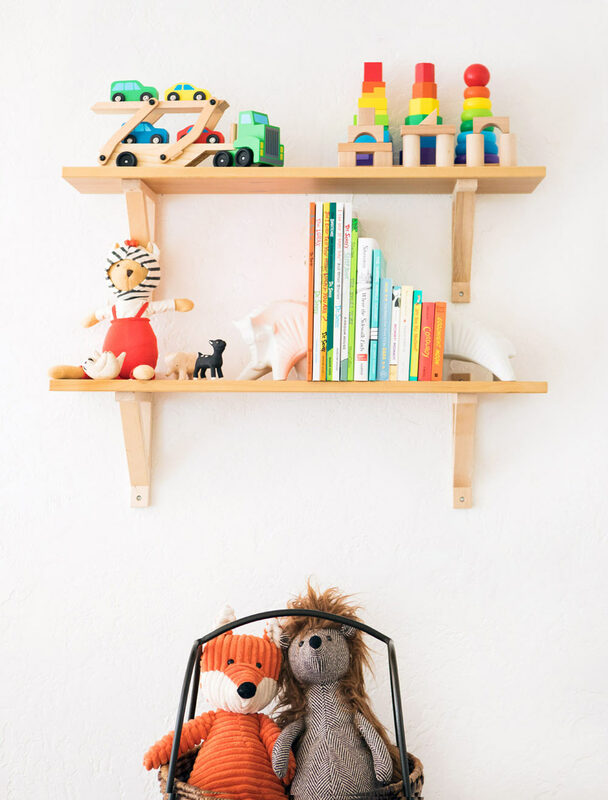 That mobile was a gift from our friends Mirla and Olaf who were traveling through Peru around the time Teo was born. They are my favorite things in the room, they make me think of our sweet friends and the love we are so lucky to have that comes from around the world. The rainbow abacus is from Ikea and has provided more hours of entertainment than I can count. 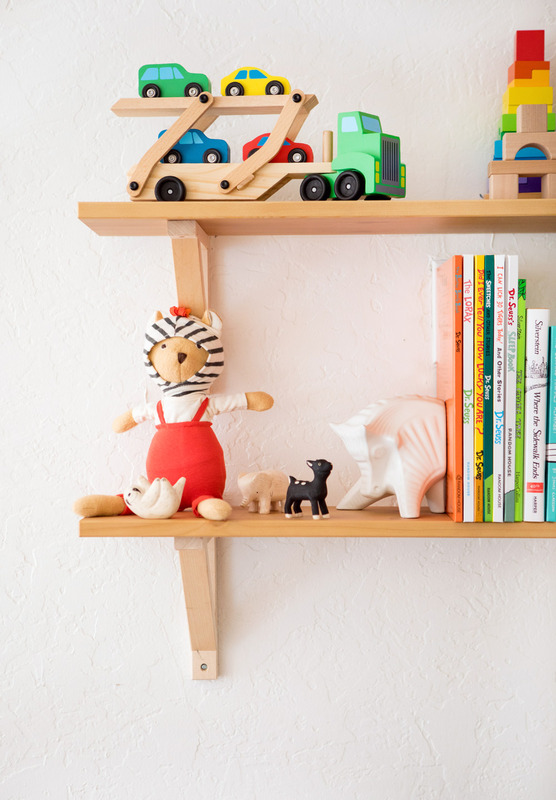 That adorable bear is from Hazel Village, the bookshelves are IKEA, and the bookends are from Jonathan Adler. The full list of sources is at the bottom of the post, and if you’re interested in anything I neglected to mention, please ask! What a sweet little room! It took us forever to get ours done too, and we’re still redoing it and updating it as our kid grows and needs/gets new things! I love everything! You sure know how to pull a room together like no one else! I may have missed it in the post, but where is the pendant light from? 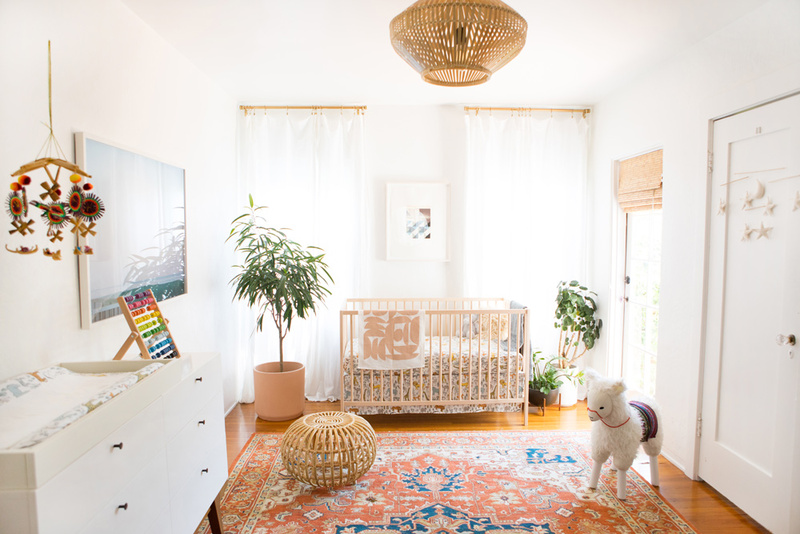 I’m in LOVE with that rug and the natural woods throughout — it’s such a gorgeous nursery! And what a little cutie! Crazy good. You have a talent. I send blessings and prayers that your real life has the same beautiful harmonious good vibes as are rolling out of these photo’s! 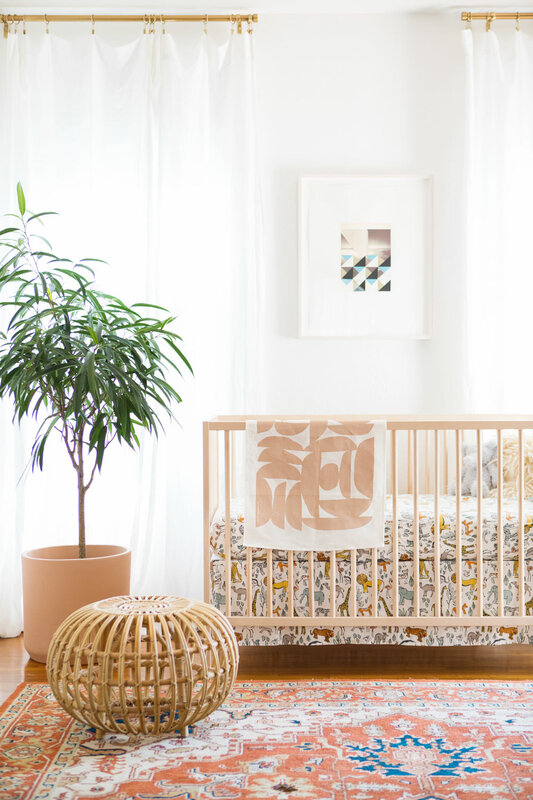 PS: I LOVE the print above the crib. So good! 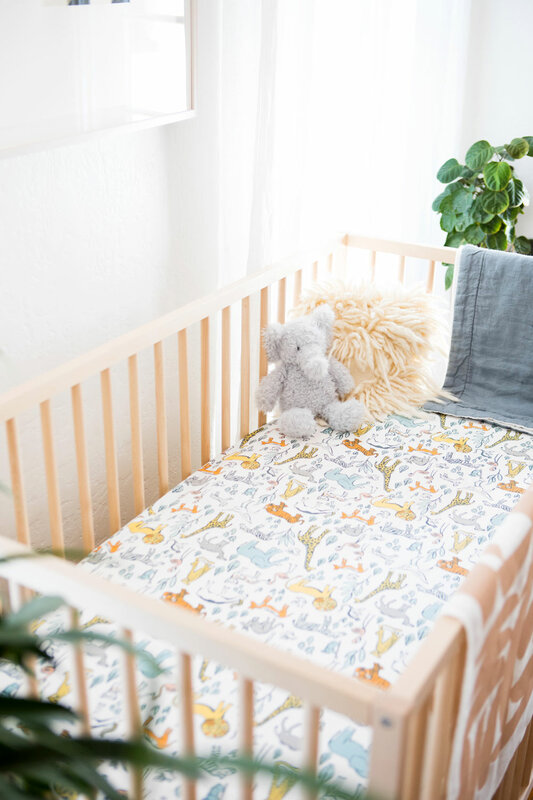 Love your designs My boy will be 1 in late October and I am still working on his nursery 🙂 I’ve been eyeing those baby blankets from Rough Linen for a while…love all of their stuff. This is so beautiful! I love the plants – can’t have a room without plants! 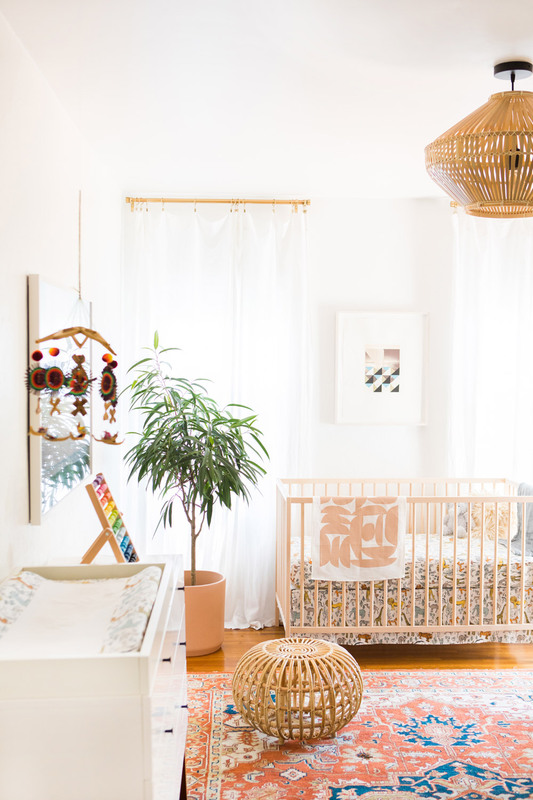 This nursery is incredible! I want to have another baby just to put in a room like this. Can I ask what the taller plant is? Is it a happy indoor variety (black thumb resistant)? Where did you find the beautiful light fixture? Yes, I’m dying to know too! May I ask where the wooden truck with cars is from? 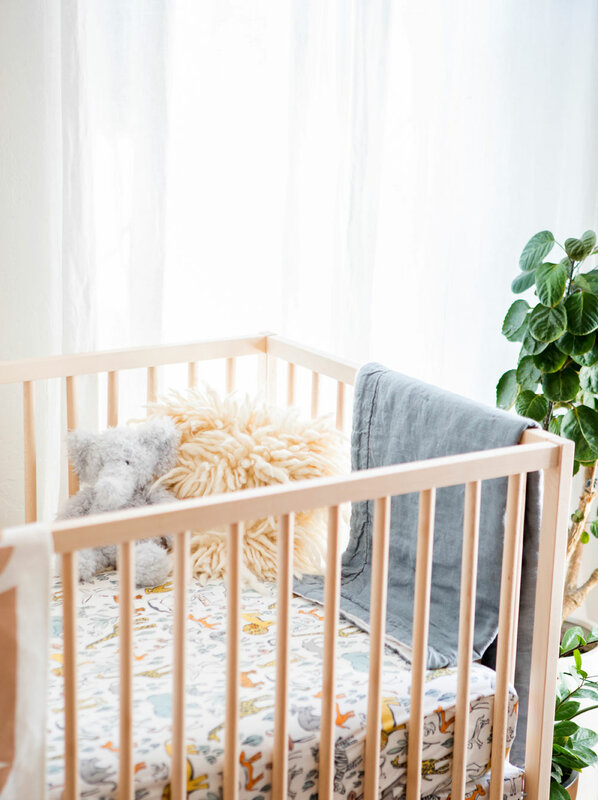 This nursery is goals. It is gorgeous. Thanks for sharing. I cannot wait to have little munchkins. Definitely going to be coming back here for ideas whenever I become a mom. Sarah, that is one beautiful baby! Those eyes! And this room – I want a llama for myself! Hope you are feeling well and enjoying life xo. I just can’t seem to skip a day without reading your blog. Everything in it just fascinates me, specially that you are able to send the message across very well. Thanks again! This is such a beautiful space & I love that you have made it so he can grow into it. That elephant toy is absolutely adorable, jus like all the other little touches in this room. Love it! Sorry if it is already mentioned in this post/comments…I cannot seem to figure out what types of houseplants are in the planters. Do you know the names? Can you share them please? Thanks!! !